On this 11 day journey from Beijing to Chengdu, visit rare giant panda cubs in Chengdu, view the Great Wall at Mutianyu and cruise the Yangtze River. Begin your amazing discovery of China with a Peking duck welcome dinner. Your hotel for the next four nights is located close to the Forbidden City and many shopping malls. Spend an unforgettable evening at either the famed Peking Opera or the spectacular Kung Fu Show. Choose between mixed Asian at Lost Heaven or Western dishes at The Exchange. Enjoy the afternoon at leisure to perhaps shop at the Silk Markets. Explore the Summer Palace and enjoy a cruise on Kunming Lake. Later, fly to Yichang to join your boutique cruise ship, Yangzi Explorer. On board, enjoy included wine and beer with your lunch and dinner. Visit the Three Gorges Dam project site. Later, sail through Xiling Gorge while sampling afternoon tea. Tonight, enjoy the Captain’s reception. Glide through the dramatic gorges of Shennong Stream by longboat (sampan). Later, traverse Wu Gorge, known for its sheer rock walls, and Qutang Gorge, the most dramatic of the three gorges. Join an insightful excursion to Fuling to see the 816 Underground Project. Tonight, mingle at the Taste of China gala dinner. Be sure to dress in your finest Chinese outfit. Dinner is a delicious choice between traditional Sichuan cuisine at Shang Palace, western ribs and burgers at Mooney’s Irish bar, or international fare at Café Z. Wander through the old quarter of town and visit Jinli Street, one of the oldest commercial streets in China, and the second century Wuhou Temple. Depart after breakfast today and transfer to Chengdu airport. Discover the best of China on a 14 day tour from Beijing to Shanghai. Visit the Great Wall, enter the Forbidden City and see the Terracotta Warriors. 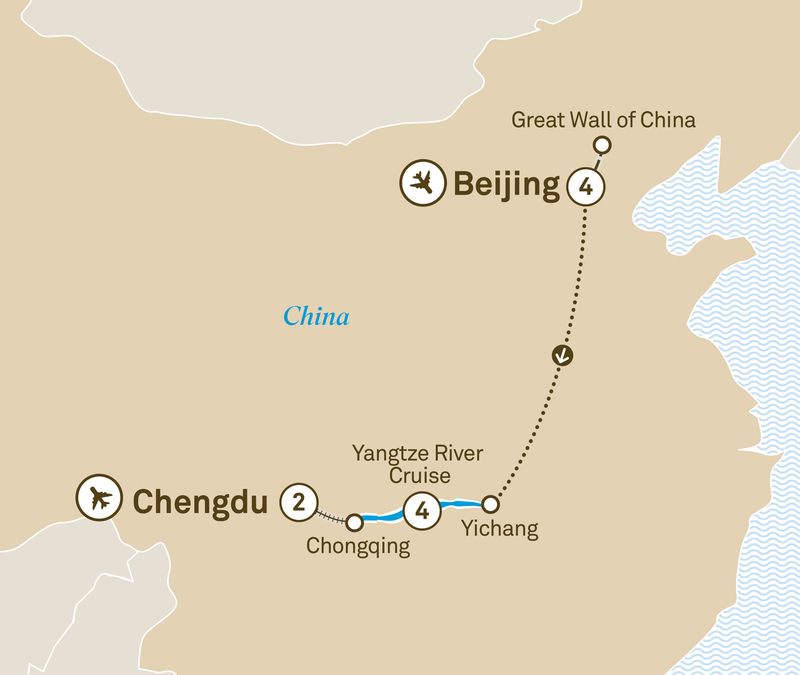 Enjoy an 18 day adventure from Beijing to Shanghai. Discover the Great Wall, Forbidden City, Terracotta Warriors and a luxurious Yangtze River cruise.